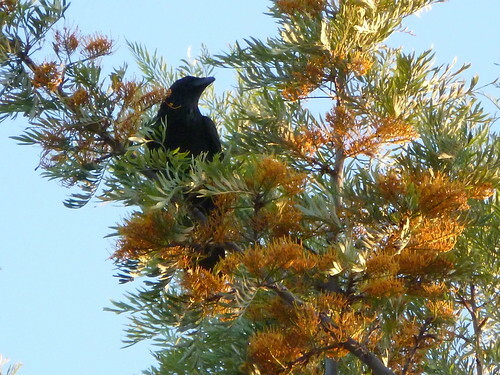 The neighborhood has a lot of ravens, and on Friday evening an ‘unkindness’ of them settled on one of our trees. Nobody is really sure why, but the raven population in the Bay Area has grown dramatically in recent years. A bird guy says that they are “open-program” animals, and figure out how to adapt to their environment by observing and learning, and in so doing become more successful. This tree is a Silver Oak, which is not really an oak but a really large Grevillea. 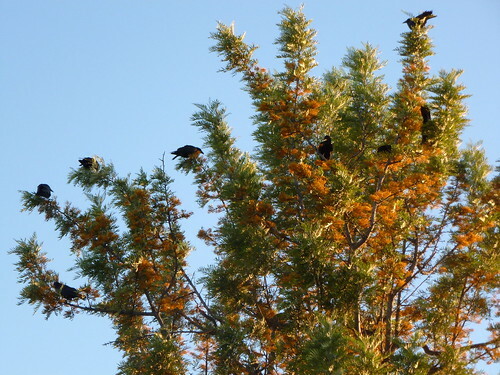 As you can see here, the tree has beautiful orange seed pods. They fall from the tree and on to our driveway and cars, and are very sticky. The tree drops all of its giant, sturdy leaves in late winter. So it’s kind of high maintenance. You sometimes see these trees near freeways that were built in the 1960’s. We have a few other freeway plants on our sod; Lemon Bottlebrush, and Oleandar. Probably a Caltrans guy lived here during that time and brought a few extras home.